FITC-Labeled Human CD19 (20-291) (Cat. No. CD9-HF2H2) is expressed from human HEK293 cells. It contains AA Pro 20 - Lys 291 (Accession # P15391-1). It is the FITC labeled form of Human CD19, His Tag (Cat. No. CD9-H52H2). The protein has a calculated MW of 32.0 kDa. The protein migrates as 45-55 kDa and 90-100 kDa under reducing (R) condition (SDS-PAGE) due to glycosylation. The primary amines in the side chains of lysine residues and the N-terminus of the protein are conjugated with FITC using standard chemical labeling method. The residual FITC is removed by molecular seive treatment during purification process. The FITC to protein molar ratio is 1.5-3. Please protect from light and avoid repeated freeze-thaw cycles. FITC-Labeled Human CD19 (20-291) on SDS-PAGE under reducing (R) condition. The gel was stained overnight with Coomassie Blue. The purity of the protein is greater than 90%. 293 cells were transfected with anti-CD19-scFv and RFP tag. 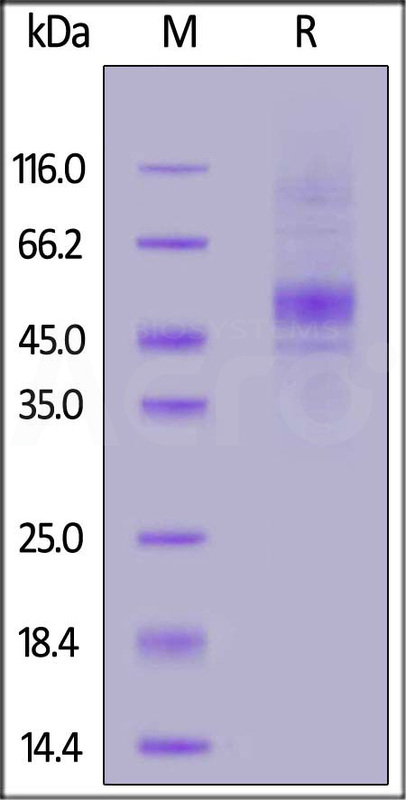 2e5 of the cells were stained with B. FITC-Labeled Human CD19 (20-291) (Cat. No. CD9-HF2H2, 10 µg/ml) and C. FITC-labeled protein control. A. Non-transfected 293 cells and C. FITC-labeled protein control were used as negative control. RFP was used to evaluate CAR (anti-CD19-scFv) expression and FITC was used to evaluate the binding activity of FITC-Labeled Human CD19 (20-291) (Cat. No. CD9-HF2H2) (QC tested). (1) Pesando JM, et al., J. Exp. Med. 170 (6): 2159–64. (2) van Zelm MC, et al., 2006, N. Engl. J. Med. 354 (18): 1901–12. (3) Bradbury LE, et al., 1992, J. Immunol. 149 (9): 2841–50. (4) Horváth G, et al., 1998, J. Biol. Chem. 273 (46): 30537–43. (5) Imai T, et al., 1995, J. Immunol. 155 (3): 1229–39. (6) Doody GM, et al., 2000, EMBO J. 19 (22): 6173–84.